Every year, millions of Americans have a suspicious mole or skin lesion biopsied and sent to a pathologist to learn whether it is a potentially deadly melanoma. The pathologist’s interpretation is important: If the lesion is judged to be benign, no treatment may be recommended, but if malignant, the patient will typically undergo surgery and possibly other treatments. New research indicates that pathologists are likely to agree when lesions are benign or highly malignant, but often disagree when there are challenges to how gray-area lesions are characterized. The investigation involved 187 experienced pathologists in 10 states, who had volunteered to participate. In the study’s first phase, each was asked to review and interpret 48 cases randomly selected from 240 skin biopsies. In the second phase, 118 of the pathologists viewed the same set of slides that they had interpreted before but shuffled in a different order. At least eight months had passed between the first and second viewings of the slides. (V) higher stage invasive melanoma, in which case a wide excision, ≥1cm, is recommended with possible additional treatment, including sentinel lymph node biopsy and adjuvant radiation or chemotherapy. The researchers found that the participating pathologists agreed with the consensus panel’s interpretation in 92 percent of the benign Class I cases and in 72 percent of the Class V higher-stage invasive melanomas. However, participants agreed with the panel’s consensus diagnosis in 25 percent of the Class II cases, 40 percent of the Class III cases and 43 percent of the Class IV cases. 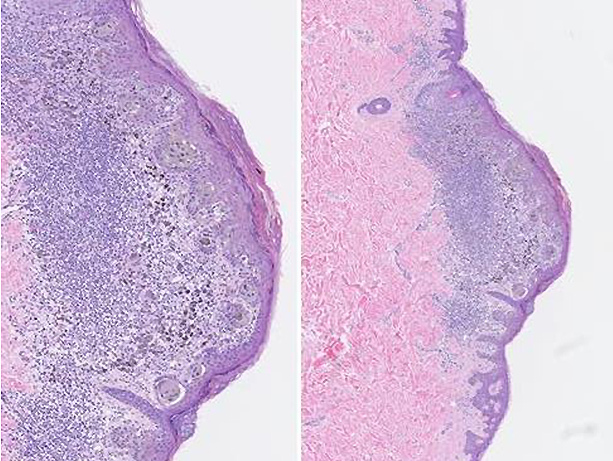 In addition to adopting more standardized classification systems, physicians could communicate to patients that there are limits to medical professionals’ ability to classify skin lesions, the researchers wrote. “We propose adding standardized statements to pathology reports reminding readers that melanocytic lesions are challenging to interpret and that variability exists among pathologists, especially in the middle diagnostic classes,” they wrote. Invasive melanoma kills more than 9,000 Americans a year. This work was supported by the National Cancer Institute (R01 CA151306, R01 CA201376, and K05 CA104699).